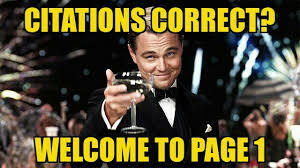 Google uses about 205 ranking factors that drive their search algorithm. Here’s the Definitive List – Some of these are confirmed others speculated by experts. It’s a bit of a monster but worth a read through at least once as it will help you identify specific issues on your websites that need attention that you may not have even considered to correct to help you rank higher. 1. Domain Age: Matt Cutts states that: “For Google Ranking Factors the difference between a domain that’s six months old versus one year old is really not that big at all.”. In other words, they do use domain age…but it’s not very important. 4. Domain registration length: A Google patent states: “Valuable (legitimate) domains are often paid for several years in advance, while doorway (illegitimate) domains rarely are used for more than a year. Therefore, the date when a domain expires in the future can be used as a factor in predicting the legitimacy of a domain”. 5. Keyword in Subdomain Name: Moz’s 2011 panel agreed that a keyword appearing in the subdomain can boost rankings: Subdomain Keyword6. Domain History: A site with volatile ownership (via whois) or several drops may tell Google to “reset” the site’s history, negating links pointing to the domain. 10. Co-Citations: Brands get mentioned without getting linked to. Google likely looks at non-hyperlinked brand mentions as a brand signal. Its many small things done well. 12. Title Tag Starts with Keyword: According to Moz data, title tags that starts with a keyword tend to perform better than title tags with the keyword towards the end of the tag. 14. Keyword Appears in H1 Tag: H1 tags are a “second title tag” that sends another relevancy signal to Google. 16. Content Length: Content with more words can cover a wider breadth and are likely preferred to shorter superficial articles. SERPIQ found that content length correlated with SERP position:Content Length SEO17. Keyword Density: Although not as important as it once was, keyword density is still something Google uses to determine the topic of a webpage. But going overboard can hurt you. 25. Recency of Content Updates: Google Caffeine update favors recently updated content, especially for time-sensitive searches. Highlighting this factor’s importance, Google shows the date of a page’s last update for certain pages. 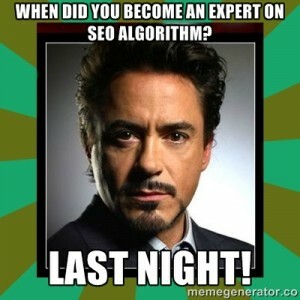 Having this SEO list makes you an expert! 29. Keyword in H2, H3 Tags: Having your keyword appear as a subheading in H2 or H3 format may be another weak relevancy signal. Moz’s panel agrees. 41. Reading Level: There’s no doubt that Google estimates the reading level of webpages. But what they do with that information is up for debate. Some say that a basic reading level will help you rank better because it will appeal to the masses. But others associate a basic reading level with content mills like Ezine Articles. 44. Page Host’s Domain Authority: All things being equal, a page on an authoritative domain will rank higher than a page on a domain with less authority. 52. URL String: The categories in the URL string are read by Google and may provide a thematic signal to what a page is about. 78. Use of Google Analytics and Google Webmaster Tools: Some think that having these two programs installed on your site can improve your page’s indexing. They may also directly influence rank by giving Google more data to work with (ie. more accurate bounce rate, whether or not you get referral traffic from your backlinks etc.). 82. # of Links from Separate C-Class IPs: Links from separate class-c IP addresses suggest a wider breadth of sites linking to you. 93. Nofollow Links: One of the most controversial topics in SEO. Google’s official word on the matter is: “In general, we don’t follow them.” Which suggests that they do…at least in certain cases. Having a certain % of nofollow links may also indicate a natural vs. unnatural link profile. 98. Backlink Anchor Text: As noted in this description of Google’s original algorithm: “First, anchors often provide more accurate descriptions of web pages than the pages themselves.” Obviously, anchor text is less important than before (and likely a webspam signal). But it still sends a strong relevancy signal in small doses. 102. Link Location In Content: Links in the beginning of a piece of content carry slightly more weight than links placed at the end of the content. 120. Schema.org Microformats: Pages that support microformats may rank above pages without it. This may be a direct boost or the fact that pages with microformatting have a higher SERP CTR. 164. Known Authorship: In February 2013, Google CEO Eric Schmidt famously claimed: “Within search results, information tied to verified online profiles will be ranked higher than content without such verification, which will result in most users naturally clicking on the top (verified) results.” Although the Google+ authorship program has been shut down, it’s likely Google uses some form of authorship to determine influential content producers online (and give them a boost in rankings). 175. Country TLD extension: Having a Country Code Top Level Domain (.cn, .pt, .ca) helps the site rank for that particular country…but limits the site’s ability to rank globally. 184. Page Over-Optimization: Many people report that — unlike Panda — Penguin targets individual page (and even then just for certain keywords). Hope this helps if you know of any others let me know! The following time I learn a weblog, I hope that it doesnt disappoint me as considerably as this one. I imply, I know it was my choice to read, nevertheless I actually thought youd have something intriguing to say. All I hear is a bunch of whining about 1 thing which you may possibly fix for people who werent too busy on the lookout for attention. Thanks I think? Not entirely sure what you mean by whining? This article helped me a lot and I’ve also realized a similar one by analyzing this article. I hope I’ve figured out in the end how do you also get ranked first in Google.